Lori Trahan shakes students’ hands immediately after arriving at Assabet. 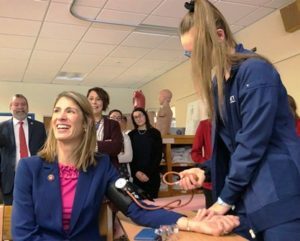 Marlborough – Assabet Valley Regional Vocational Technical High School packed its school restaurant Jan. 28 to welcome U.S Congresswoman Lori Trahan as she chose theirs as the first high school to tour since her November 2018 election win. 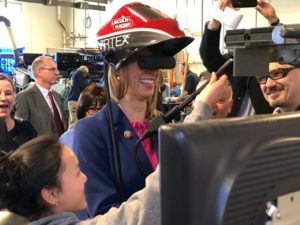 The congresswoman drew a gaggle of reporters, students, state and local politicians, and school staff with her as she visited Assabet’s metal fabrication, advanced metal fabrication, and health technologies shop classrooms. She also stopped along the way to gather feedback from teachers on the needs of local vocational schools. 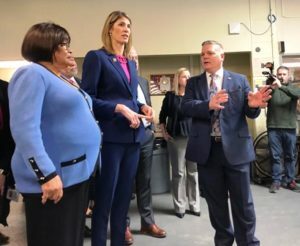 Throughout the visit she discussed her father’s experience as an iron-worker in Boston’s Iron Workers Local 7 Union and her husband’s own graduation from Greater Lowell Technical High School. 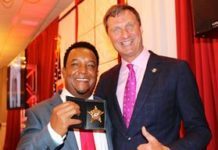 But before it all, she touted her recent successful lobbying effort to get placed on Education and Labor Committee’s Higher Education and Workforce Investment and Health, Employment, Labor and Pensions (HELP) subcommittees. 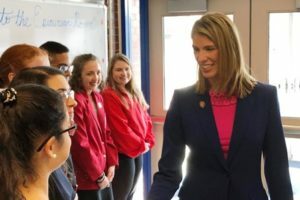 Hoping to use that committee spot to potentially direct funding back to her district and schools like Assabet, Trahan said she was hopeful for the legislative future of policies influenced by tours like that on Jan 28. 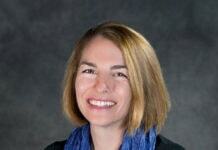 “There’s going to be a lot of opportunity to work in a bipartisan way on vocational education,” she said. Assabet School Committee Chair Virginia Simms George and Trahan listen to Assabet Superintendent Ernest Houle discuss Assabet’s advanced metal fabrication shop. Lori Trahan speaks to an assembled group of school officials, reporters, students, and local and state politicians before touring the school. Trahan looks on as two advanced metal fabrication students show her a metal milling machine used to smooth rough pieces of metal. Trahan smiles while a student in Assabet’s health technologies shop takes her blood pressure.